Claire O'Sullivan was raised on a small family farm just outside Bantry town in Southwest Ireland. 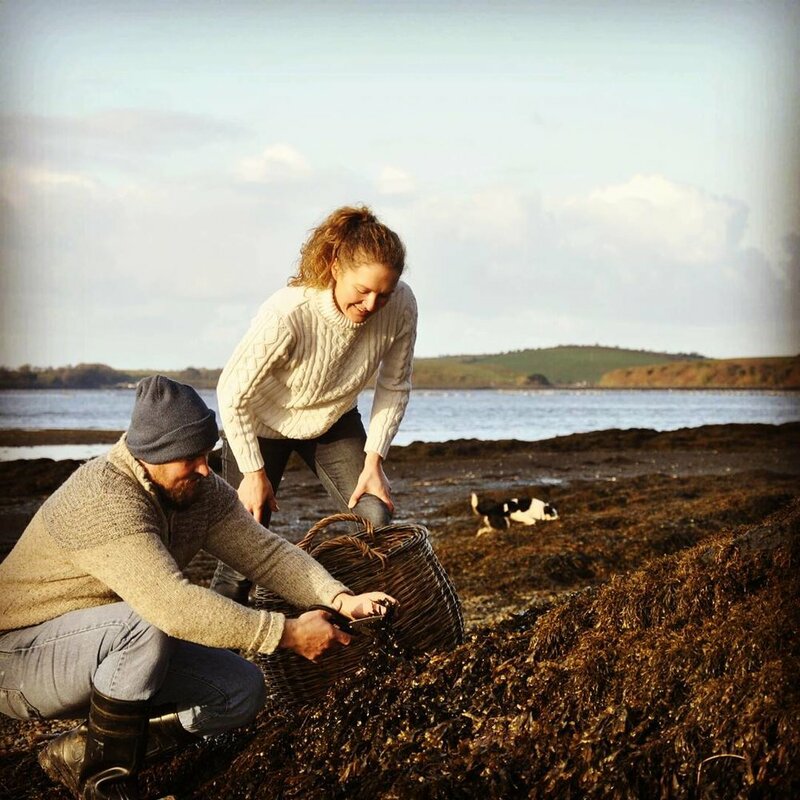 Growing up, seaweed played a fundamental role in the health of the land and her family- for many generations in Ireland, gathering and spreading seaweed on the land was key for encouraging fertility and a successful harvest. In recent times, remembrance of this ancient gift from our seas has been slipping away--Claire strives to have seaweed reintegrated into our food culture. Claire's secret weapon is her amazing partner Eli, who had a strong affinity for the sea from a young age. He could swim before he could walk! From the age of ten, he and his younger brother would sneak out of home before the morning light to go to work on the fishing boats in Bantry. By twelve he was skipper and has been working on boats and the sea ever since. Eli always looks forward to a day connected to the sea whether on shore collecting seaweed, out on his boat fishing or greeting the sunrise driving the local ferry. Together they make all the WASi products, hand harvesting, mixing, bottling and blending. Their passion for seaweed, it's healing and nutritious qualities have led them to establish WASi. Creating delicious, user friendly products they are determined to see seaweed back on kitchen tables everywhere for all to enjoy. For them, there isn't another form of vegetation on the planet possessing such a perfect balance of vitamins, minerals and trace elements. Our Seaweed - the story behind every jar. The journey to creating each and every jar starts by consulting the Moon. As we hand harvest all our seaweeds, the tides dictate when they will allow us to access their treasure. Sometimes, this is at an earthly hour but more often it feels that we are awake before even the birds. To ensure the vitality of seaweed for generations to come, we carefully cut only a small portion of the plant. Before we return to this plant again, it will have completely regenerated itself....that is the magic of seaweed! Collecting seaweed is our favourite stage in the creation of our pestos. Breathing in the fresh sea air, nestled amongst the tall, humbling rocks, salt water lapping against my wellington boots, seagulls swooping down full of chatty curiosity- and beyond all; a great overwhelming sense of ancient timelessness in these core moments of connection with the tapestry of human existence. Once back home the real work begins, washing, blending, sterilising and jarring. We make small batches each week with fresh, locally sourced ingredients. Driving to the health food stores in West Cork delivering our products is such a joy, there's a certain pride to be felt knowing we're bringing to life the foods our ancestors valued so highly in our little glass jars.